Recently I’ve been trying some new recipes for M and I to try that are healthy and delicious. It’s been fun! Friday morning I tried Tina’s French Toast Scramble. At first I was skeptical about the taste…I mean, egg whites and a banana? But, no…really, this was so yummy! I used 2 egg whites, a banana, honey, cinnamon, a dash of nutmeg, and then a scoop of peanut butter in a mug as I ate this with a glass of nonfat milk. I didn’t expect it to hold me over, but I was surprised that I wasn’t hungry until it was time for my mid-morning snack of an apple. This is definitely now in my breakfast rotation! Monday I told you about M’s healthy banana cookies… I’m excited to try some more healthy cookie recipes now. Sunday I tried Anne’s chunky turkey vegetable soup. I had been wanting to give this a try, and we had veggies to use up in the fridge. This was one of the most delicious vegetable soup recipes I’ve ever had, and it was so easy! 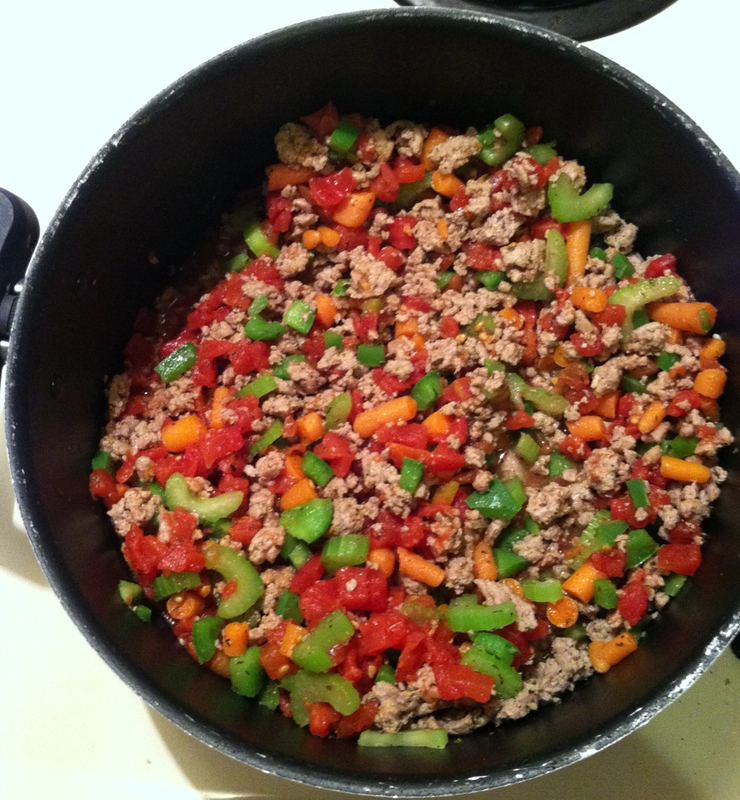 I diced up a green bell pepper, 2 (or 3, I can’t remember) celery stalks and a couple big handfuls of baby carrots and combined those with a can of diced tomatoes (low sodium), browned ground turkey, and brown rice. It was very hearty and full of flavor (check out her post with the list of spices). (I didn’t have any kale, but I have thought about adding some spinach to this recipe some other time.) We decided next time I need to double the recipe for leftovers, and that this was definitely a keeper in the dinner rotation. This chunky turkey vegetarian soup is so colorful, which means it’s nutritious on top of delicious! So there you have it, just a handful of the new recipes I encourage you to try. One of my goals is to try some new things with cooking, and so far we’re on a good roll! This entry was posted in Healthy eating, Recipes and tagged Cooking, Healthy eating, Healthy recipes, Recipe, Soups and Stews by Megan. Bookmark the permalink. No problem! I love your blog and always intrigued by your recipes!